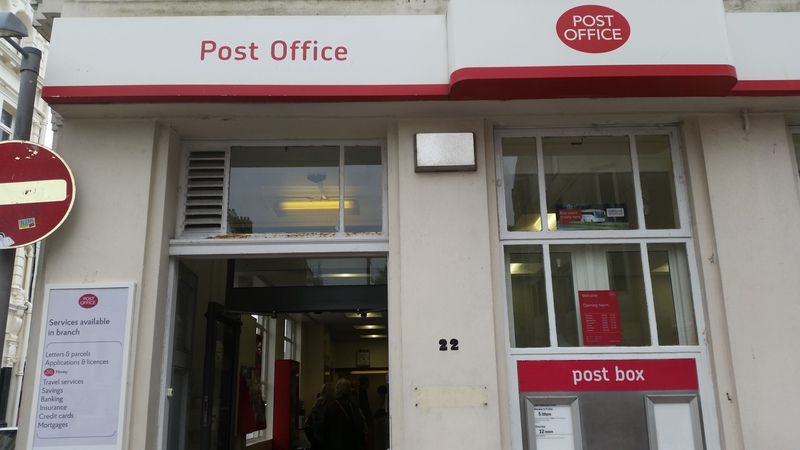 Residents argued that elderly and blind residents of Brunswick would be unable to walk uphill to Melville Road in Seven Dials to collect their pensions when the Western Road Post Office closes in January at a public meeting. A petition organised by City Books and available in 50 other Brunswick businesses has been signed by more than 5,000 Brighton and Hove residents, including 2,000 online signatories. Petitioners oppose a two-tier post office. She explained that Post Office Ltd owns a “crown network” of flagship branches, attracting government subsidies, as well as franchised post office branches. Nationally the crown network has made a loss of £12 billion, said Ms Tarling. Post Office Limited is state owned but Royal Mail is a private company reliant on government subsidies. Ms Tarling explained that the government subsidy has reduced by £40 million nationally. Hove MP Peter Kyle chaired an emotionally charged public meeting of at least one hundred concerned residents at the Cornerstone Community Centre. There was a consensus at the meeting that the post office was always busy at many different times of day. The Western Road Post Office is a Brunswick community asset. Ms Sweetman said that upstairs rooms could be converted and sublet to raise money. The freehold was sold 11 years ago. Ms Tarling said that staff would not be made redundant or redeployed until after the consultation. As part of the current consultation, 40 branches are threatened with closure because people’s habits are changing and more people are shopping online, said Ms Tarling. Daniel Wells said that the post office was missing a massive commercial opportunity to deliver parcels sold through ebay, for example. Valerie Paynter suggested expanding the empty EcoStream building to make the post office bigger and she criticised “the unbelievable reliance on small vulnerable retailers to replace crown post offices”. 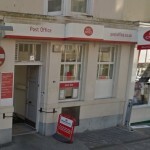 There are four post offices within a mile of Brunswick’s Western Road Post Office in Church Road, near Grand Avenue, Blatchington Road, north of George Street, in WH Smiths, in Churchill Square, and in Melville Road at the Seven Dials. 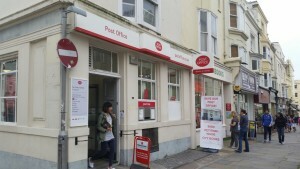 Several people intervened to call for much-needed investment into the retail element of the post office. There were calls to reward outstanding staff at the Western Road Post Office who have won awards for their customer service. Public consultation runs for 12 weeks until Wednesday 16 September. People are invited to respond, in particular, about the suitability and accessibility of branches including the inside of premises. Residents raised concerns about the lift and escalator at WH Smiths Post Office and the lack of seats for those with restricted mobility. Ms Tarling agreed to monitor WH Smiths and noted public dissatisfaction with the post office there because of accessibility issues. Comments and questions about the consultation can be submitted through an online questionnaire at postofficeviews.co.uk by Freepost: Your Comments to Post Office Ltd, via email to comments@postoffice.co.uk, via the customer helpline on 08457 223344 or Textphone 08457 223355. 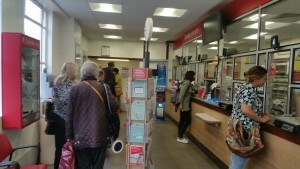 In all post office communications, customers are asked to quote branch code 01090799. No decision has yet been taken about the future of the Western Road Post Office but if the merger goes ahead, it will take place in January. Brighton and Hove residents can oppose the closure by signing Save Brunswick Town Post Office online petition here or by signing a hard copy of the petition at City Books or 50 different businesses in Brunswick. What I actually criticised was not small Crown post offices, but reliance on asking small, vulnerable, retailers to replace Crown Post Offices. If these various unconnected retailers close for whatever reason, it terminates postal service – as happened when the Church Road Post Office (now Pizza Express)near Hove Town Hall closed and a franchise opened across the road, only to close a few years on, when the postmistress wanted to retire. That was a messy time and very worrying, until then cllr Jan Young managed to persuade the newsagent 7 or 8 blocks east, in Church Road, to agree to take on a small postal service. Small retailers are highly vulnerable to overheads pressures such as rising rents and business rates. We need the security of anchored Crown Post Offices which are deemed to be essential services. This is not something you can impose on a franchisee for very long. It is a disgrace that Royal Mail, Post Offices plc (whatever it all is in its broken up state of on the way to complete shut down)sold off their freehold buildings, replacing cheap overheads with the expense of leaseholds. Total insanity. What came out in the meeting, quite shockingly, was the fact that the lease on the current Western Road P.O. (which they USED TO OWN)has already EXPIRED, making the ‘consultation’ look cosmetic after a fait accompli decision to close it. They insist the consultation is genuine. I then made them aware that the former Post Office at Hampton Place, lately vacated by Eco-Stream, is currently available. And I suggested they expand rather than contract as a way of becoming more profitable. I have high hopes this will be looked into, and one of the Post Office reps there emailed the photo I had of that former Post Office on my iphone to himself (from my phone). Others suggested they expand their banking offer. Banks send people to Post offices when they want to close and post offices send people to banks. Maybe they should share premises! Whatever, the dismantling of the civil structures that ARE civilisation has got to stop. We live on terra firma not inside the internet. We are not robots yet. The ex Post Office on Western Road, corner of Hampton Place still boasts a post box outside of it and being close to Waitrose, it has more passing trade than the one facing closure. I was reminded by a former Labour cllr attending last night that when Hampton Place was facing closure, people were told they had the one further up Western Road to use instead. Ironic, therefore, that this ‘alternative’ now faces closure! Did the lady really say that the Crown Offices single handedly are responsible for the Chancellors deficit. By the way in the approval for the subsidy given by Brussels the subsidy is allowed for the Post Office to operate a network beyond that required commercially so that the totality of the UK population has access to a particular range of services. Perhaps Ms Tarling should read the approval given for POL to receive State Aid. This is management of staggering ineptitude over several decades. Was it the freehold at Ship Street that was let go? Along with those at the corner of Hampton Place[perhaps Ecostream bought the freehold – and still have it!] and the sites at Brunswick Town and at Church Road, Hove? I suspect it was. If so, we are in the loony world of sale and lease-back, PFI and so on, wherein you get a short-term financial fix [at a ludicrous discount] and then pay out for ever to recover that which was yours to start with. Vis-a-vis Melville Road: that office has a very limited catchment area for easy accessibility. The catchment area does not include the Brunswick Town area at all; Melville Road is not an alternative. Which leads me to think that the Post Office has two targets in view, the one at Western Road next to City Books first, and then Melville Road within three years.